Michael: Welcome to the interactive lesson on the style of The Ventures. The Ventures were well known as the premier "surf rock" band of the '60s. They featured simple guitar rhythms and melodies with a clean guitar running through a fender reverb and was the classic sound of that age. This lesson is excellent for beginners who want to learn how to play rhythm and simple lead melodies and fun for advanced players as well! Michael: This pattern has a basic up & down strum in sets of 3s. Michael: Yes Kaan, here's the chord pictures. Michael: Let's move to the 2nd chord, now we continue with F, E, C, G, C to cap it off. Michael: Very simple, here's the entire progression. Michael: Now try practicing the progression over the looping jam track. Michael: Next we'll cover the licks and melody. Michael: Sure buud, here's the A Minor scale for most of the licks we'll cover next. 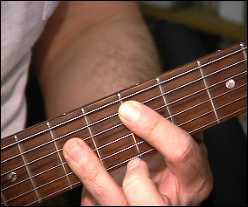 Michael: This scale starts on the open 5th string A, and uses the open position of the neck. It's easy to play melodies in this position. 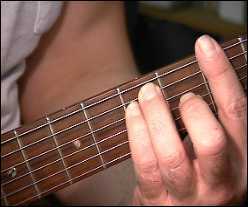 What notes are in the A minor scale? Michael: Thanks Rob, it's also considered relative to the C Major scale. 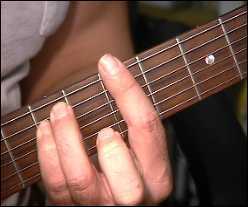 Buud: Relative minor of C major. No sharps, no flats. Michael: Same notes different order, here's our first lick. Michael: Notice how the melody follows the pattern. Michael: Here's the second lick. Michael: Pretty much the same lick, but with a different ending. Notice these licks play over the Am, G, D & E. Now you can change the melody with the chord changes. Here's the notes for the F, E, C, G, C chord change. Kaan: Very easy, but it has a good sound. 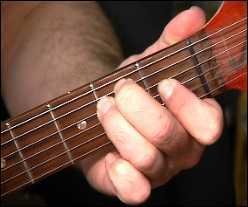 Michael: This lick has kind of a "Secret Agent Man" picking pattern, it picks between the 1st and 2nd strings. Michael: Well hey everybody I have to go, see you next lesson!